Specialised Covers the original cover company, in 1981 the UK's first tailored car cover burst onto the market from Specialised Covers. Over 30 years on, they remain the leading company in protective solutions for vehicles. Specialised Covers are proud to be partnered with some of the automotive industries most prestigious manufacturers, including Aston Martin, Bentley, BMW, Audi amongst others as well as supplying many other leaders within the leisure and motorbike industry. Specialised Covers are official suppliers to the Swift Group range of caravans and motorhomes. Whilst using the most up to date manufacturing techniques, our production facility in West Yorkshire houses some of the UK's most experienced tailors, designers and seamstresses. 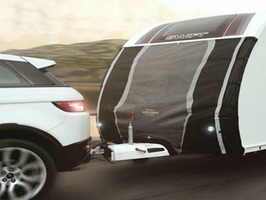 Homestead Caravans are stockists of Specialised Covers Tow Pro Lite Universal Front Towing Protector which prevents damage to the windows and bodywork to keep your caravan front clean and dry whilst in Transit. It utilises the existing awning channels for an easy secure fit, and is designed to fit a wide variety of old and new caravans. Specialised covers use the best selling “Stormshield” fabric, this improved material choice offers greater protection from impact damage and is perfect for the job. The Tow Pro Lite Universal Front Towing Cover is designed to help with the prevention of: stone chips, road film, dirt build up, exhaust debris and insect residue. Ideal for preventing the caravan from becoming easily damaged and tarnished, ultimately these can result in costly repairs, spoiling your caravans appearance and long term value. The Tow Pro Universal Cover also protects against insect residue and road dirt to save constant cleaning of the caravan. The second generation of Tow Pro Lite is leap years ahead of anything else on the market. With premium quality materials and high quality British manufacturing standards means you are getting the ultimate in towing protection. The Specialised Covers Tow Pro Lite Universal Front towing Protector comes complete with its own waterproof and breathable storage bag. The envelope bag enables you to remove the cover when you arrive at site and stow it away in your locker.